The heart and soul of a food styling and food photography business centers on the camera you use for your images. If you buy a new camera for this function, what specifications are important to you? Is your main focus on the weight of the camera, the megapixels, or a large image sensor? Or is it something else, like the quality of the brand, the design of the camera body, or the cost? What’s your favorite brand? You may already have a preference toward a brand that resonates with you. For example, do you lean toward Team Nikon, Team Canon, or Team Olympus? With about a dozen major brands in the field today, you can quickly narrow down the field by choosing one or two favorite brands and exploring the camera options in that line. If you already have existing lenses for a camera, deciding on a new camera may be a little easier than you think. Many camera lines have lenses that are compatible between older and newer models and even between film and digital SLRs. How much camera can you afford? Decide on what you can afford and stick to it as you go through the comparison process. Prices for a prosumer digital SLR start at about $400, with a good, solid camera body running about $800 and up. The professional range starts a little higher in price, generally in the low four figures. If you’re looking for a budget-conscious option but are set on a pro camera, a good choice may be to purchase a lightly used digital SLR from a reputable camera store. Doing so is a great way to get an awesome camera for a much lower price! What features are important to you? When you’re looking at a new camera for food photography, shooting in near darkness isn’t the most important feature. Nor is HD video capability. But megapixels and image sensor size? Heck yes! They affect the quality of the image and are very important when considering a camera. Weight can also be an important factor to think about, particularly if you shun tripods and the like. Also, the light metering, the focusing model, and comfort with the viewfinder are important features to consider. How much do megapixels matter? Just because a camera has a high megapixel number doesn’t mean the camera will produce high-quality images. The size of the camera’s image sensor (in combination with the megapixel count) is also a key factor in the quality and size of the image. So whatever megapixel count you choose, the larger the image sensor, the better. A full-frame 35mm sensor is the optimal situation but is quite expensive. Digital SLRs with full-frame sensors start at about $2,000 and go up from there. Point-and-shoot cameras definitely have their place in the food styling photography world. These cameras have decent quality and slim profiles, and many have a high megapixel count. But these cameras simply don’t allow for a high enough image quality or provide enough control to create the images you need for a food photography business. Ever higher megapixel numbers are the major selling point for many point-and-shoot cameras, but the quality of the images depends greatly on the physical image sensor size in a camera. You can have a slim point-and-shoot camera that proudly boasts 12 megapixels, but it may have a miniscule image sensor that won’t pick up anywhere near the image detail of, say, a 12-megapixel digital SLR with a much larger image sensor. The Leica D-Lux 5 (around $800) and its lower-priced counterpart the Panasonic Lumix DMC-LX5 (around $400; shown in the following figure) are point-and-shoot cameras that will do quite nicely in a pinch — if you really can’t go the digital SLR route. These cameras boast a large image sensor, RAW capability, high ISO support, Leica optics, and manual settings options. Although you’re limited to the existing zoom lens in these two point-and-shoot cameras, the quality is quite beautiful because of the Leica optics within. These cameras are fine to use occasionally for smaller stuff, like some low to midrange stock agencies or for blog usage, but they’re definitely not the type of camera you want to take on an advertising or packaging shoot. 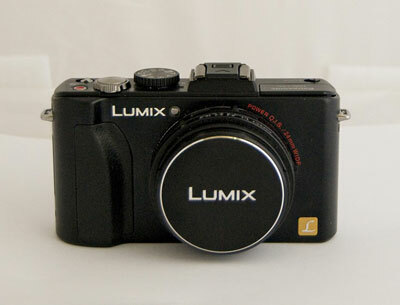 The Panasonic Lumix DMC-LX5 is a quality point-and-shoot camera option.